The seafood chowder was a mega-hit: for the first time ever, I actually ran out of food today (well, I ran out of chowder, but not sandwich material). Even the one coworker from Maine, who knows a chowder when he sees one, gave it his seal of approval by going back for seconds. 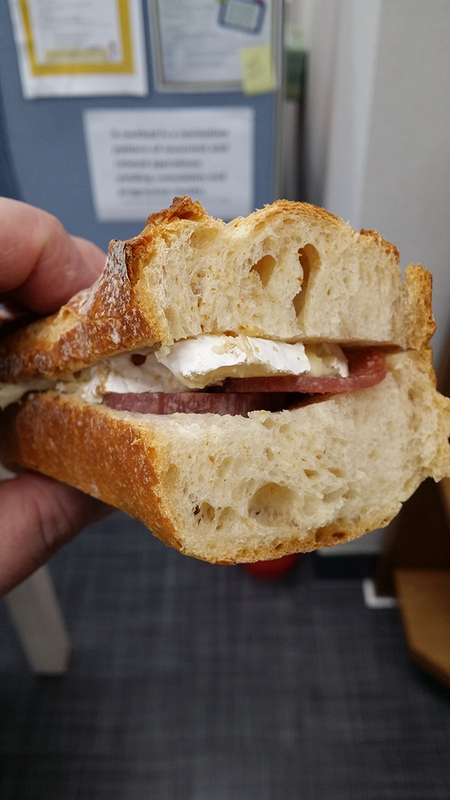 The French sandwiches were good, but I can't take credit for them because I didn't actually make anything: I simply bought the bread, the dry sausage, the butter, and the Brie, then showed my coworkers how to put everything together. 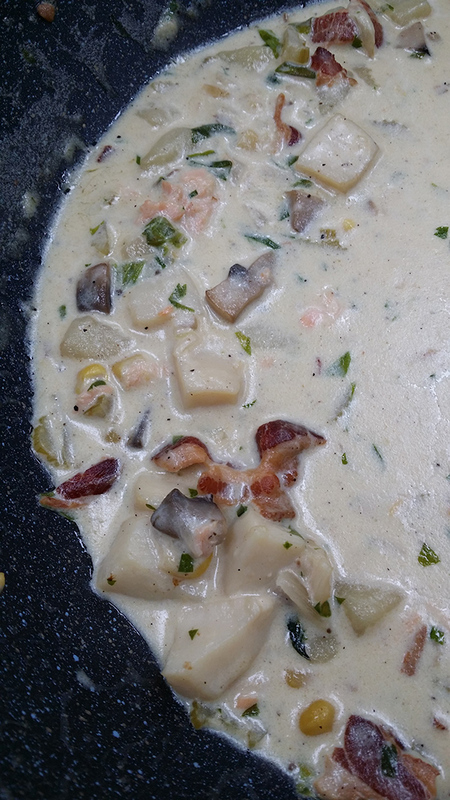 The chowder, by contrast, was a labor of love. In the end, I didn't end up using all the seafood I had bought: I decided there was no need for the jumbo shrimp since I was throwing in some mini shrimp, and although I had bought a beautiful load of huge shelled clams from Costco, I decided not to dump them into the pot until I learned more about clam anatomy: when I split one clam open (with the intention of dicing the clams into smaller pieces), I saw it had a bunch of black grit in its innards. However, when I smelled and tasted the grit, it seemed like an organic part of the clam and not something to be washed out. Temporarily unsure how to proceed, I eventually decided to nix the clams altogether for aesthetic reasons: had I diced the clams without de-gritting them and dumped them into the pot, the grit would have spread out and turned the lily-white heavy cream all gray and sooty-looking. So: no clams. I'm saving them for myself, and I'll make one of my favorite dishes, fried clams, with them this weekend. That's something to look forward to. The seafood went into the pot last, of course: you don't want to overcook such a protein, which can seize up and become rubbery very quickly. I had to do a lot of slicing and dicing of the mushrooms, onions, and celery that went into the pot. I pan-fried those veggies to soften them, fried up some crispy bacon, which I crumbled, then tossed the vegetables, bacon, diced potatoes (pre-softened via boiling), and some corn into the pot along with heavy cream and the water from the can of sweet corn I had bought. I heated this base to a low boil on Thursday night, added a bit of salt and pepper for taste, then added the seafood (salmon, scallops, and shrimp)—plus minced celery leaves—this morning. I'd been worried that the scallops might get overcooked, but everything ended up perfect, and the office gave me a big thumbs-up. The only real labor involved with the French sandwiches involved slicing the four dry sausages I'd bought into thin disks. 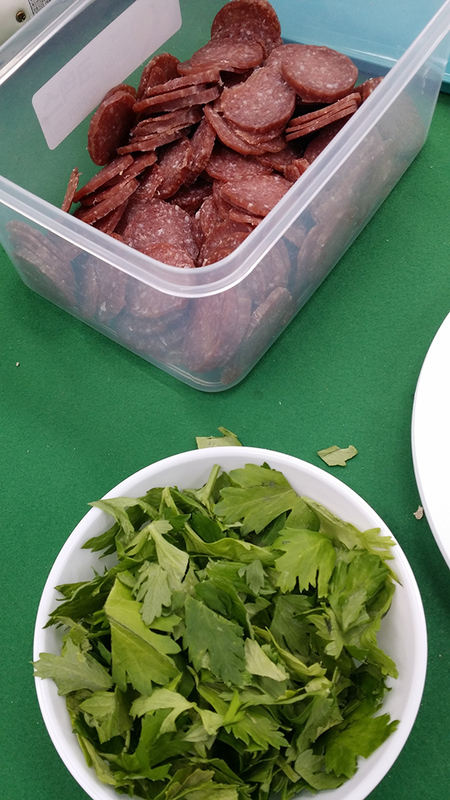 This proved to be a hypnotic, almost meditative activity, despite the bad karma that supposedly comes with handling meat. At the office, I showed people how to slice their half-baguettes to create sandwich bread; everyone laughed when my knife bit into a baguette, and the crust shattered everywhere. "But that's how you know it's a good baguette!" I said. 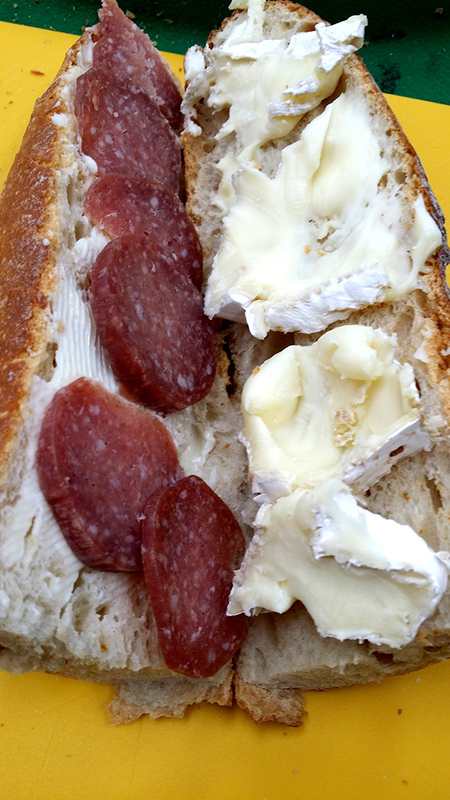 Which is true: a good baguette has a hard, shattery crust that stands in contrast with the soft, gossamer interior. Baguettes are all about contrast. Lunch culminated with Krispy Kreme doughnuts brought in by a coworker. Heavenly. 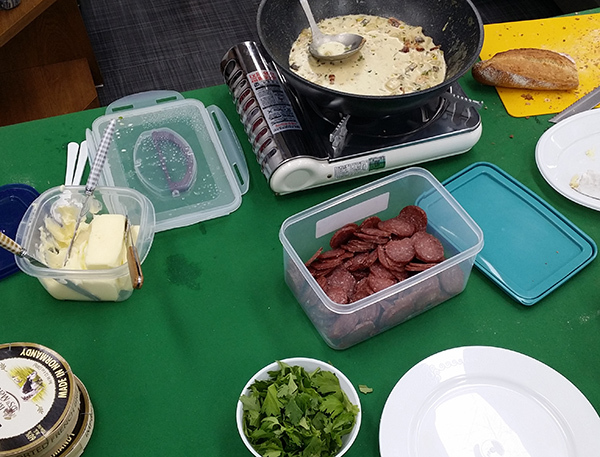 The whole office descended into varying degrees of a food coma, but after an hour or so, we were back to being fairly productive again (except for me, as I'm writing this blog post during work hours—naughty, naughty! ).